The days have grown shorter and the temperatures colder over the last few weeks. During these chilly months of the year, I am often asked the question, “Does the zoo close during the winter?” The answer is “No!”, but things do change for both the people and the animals during the winter. The Detroit Zoo is open to visitors every day except Thanksgiving, Christmas and New Year’s Day, and all of the animals at the Zoo remain here year-round and need daily care. We have at least one veterinarian and one veterinary technician at the Zoo every day, including holidays. In fact, the winter remains a very busy time for the veterinary staff. 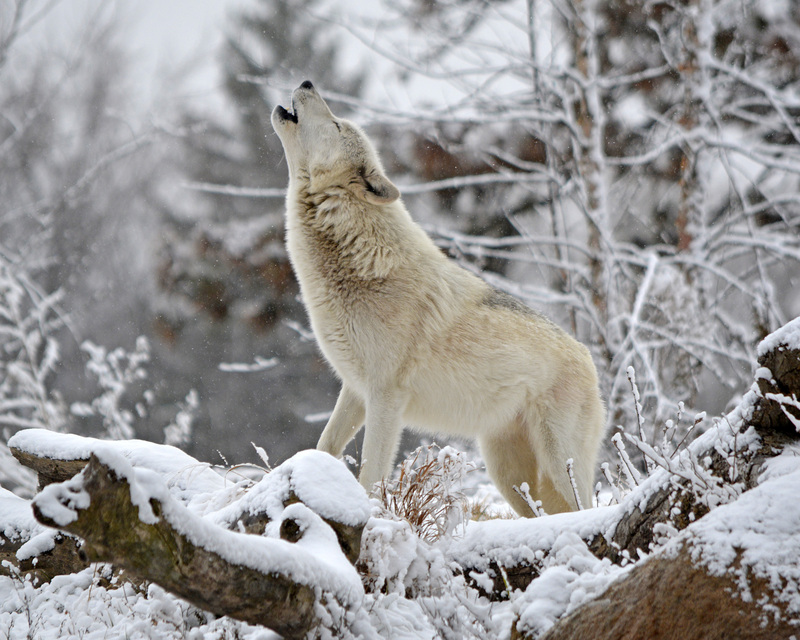 Many of the animals are able to enjoy the cooler temperatures of winter. Some animals that experience much warmer temperatures in the wild are able to grow heavier hair coats and acclimate to a Michigan winter. But even for these, enjoying time outside is always a choice – we keep the doors open so the animals can come inside whenever they choose. We also modify diets during the winter months. Some animals need more calories to keep themselves warm, and hoofstock and other herbivorous animals need access to more hay and browse to replace the pasture and plants they enjoy during the summer. 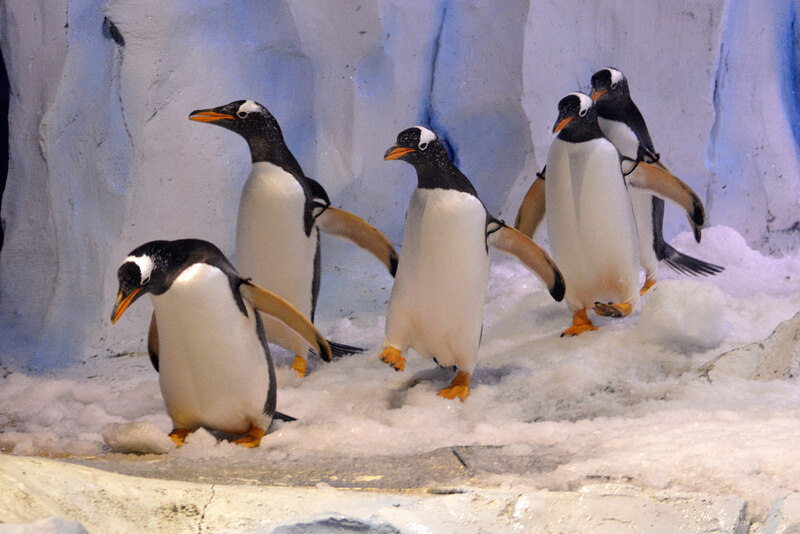 For extra fun, we bring the snow indoors for some of the animals to enjoy. The chimpanzees especially love to play in snow mounds that we bring indoors. 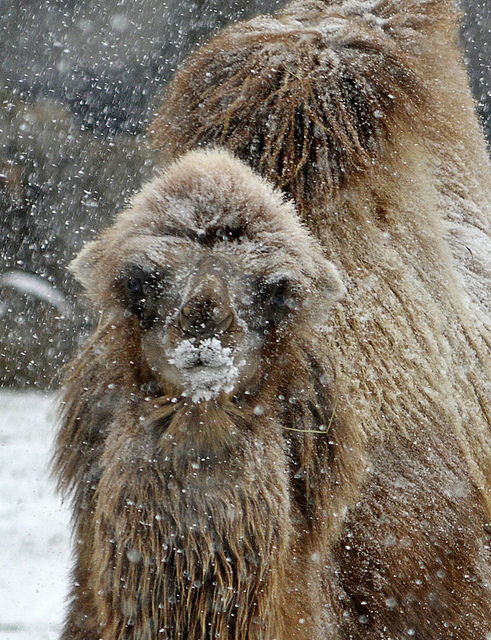 During the winter, there are often fewer visitors in the Zoo, and this has some advantages. Moving a 275-pound tiger to the hospital for radiographs and an examination is a challenging task at any time of the year. We use a large Sprinter van to transport our patients, and a second van to transport the people needed to lift and move them into the hospital. When possible, we always prefer to move large patients around the Zoo on days when we have fewer guests. There are also patients that prefer cooler temperatures. Over the last two years, we have been transporting penguins one at a time to the hospital for examinations under anesthesia. So far, we’ve examined more than 50 penguins! The habitat at the Polk Penguin Conservation Center is kept at a brisk 40 degrees Fahrenheit, so the winter months are a perfect time of year to move penguins to the hospital and keep them comfortable during the process. Winter is a great time to visit the Zoo. The Polk Penguin Conservation Center offers a new experience every time I visit, and some days you can enjoy moments of near solitude with the penguins. 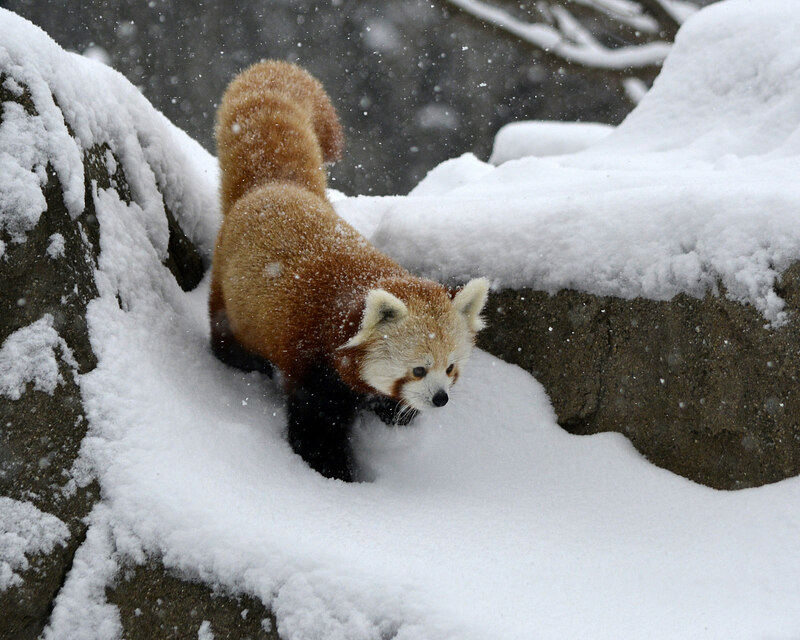 The red pandas and Japanese macaques are especially active at this time of year, and a fresh snowfall transforms the zoo into a truly beautiful place. You can also experience the magic of winter during our evening Wild Lights event, featuring 5 million lights and activities for guests of all ages. We all have more than four months of winter to enjoy/endure. I find the best way to get through the winter is to get outside and enjoy it! So, I’ve rummaged through my office closet for my winter hat and gloves, started wearing my long underwear, and I am embracing the winter season! Hope to see you at the Zoo! Far too often, the term conservation is perceived as an effort happening in faraway places like Africa or India, but in reality, we can affect change in our own backyards. 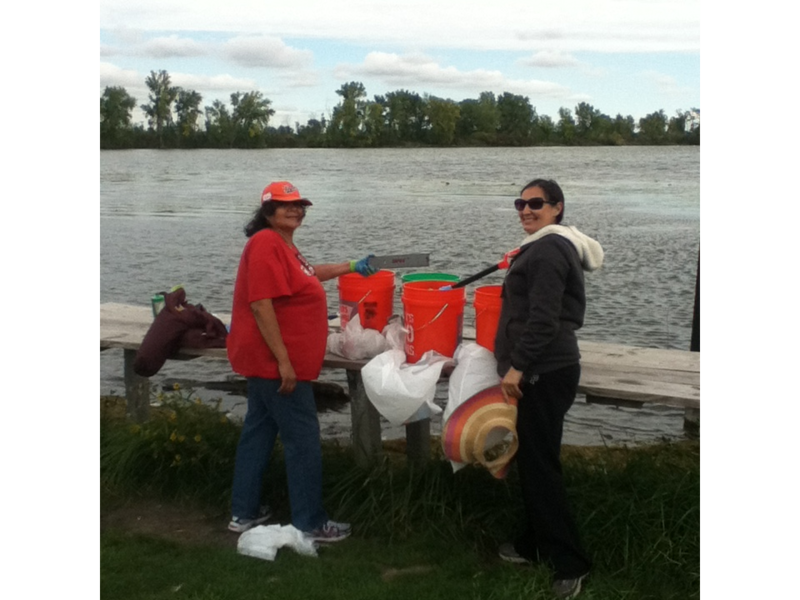 By participating in the nationwide Adopt-a-Beach program, the Detroit Zoological Society (DZS) does just that by making conservation local and giving people the opportunity to do something that can directly benefit them. Contrary to the name, the Adopt-a-Beach program is rarely done on an actual beach. What is actually adopted is a surrounding area or body of water in need of protection, e.g. a drain, a sewer, an isolated body of water or an area around a body of water. It may seem surprising to some, but adopting drains are critical areas because they lead to larger bodies of water, such as lakes and rivers. 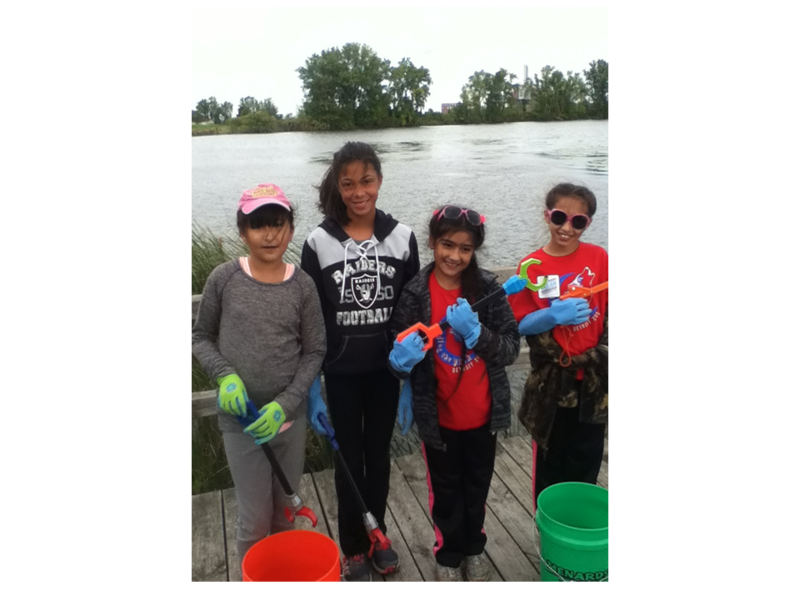 The Adopt-a-Beach program is open to people of all ages; you can sign up individually or as a group. Although this program is open to everyone, we are seeing how it is especially beneficial to students because it gives them a chance to connect the science they learn in the classroom to real-life situations. With this hands-on program, students can see how their actions impact the environment while communicating with actual scientists to see the greater picture. Before a group is able to participate, they must complete on-site training on data collection and debris disposal. After training, the group will go back to the site to collect, record, weigh and remove debris from the area ‒ with recyclables sorted out, of course. The main goal of this program is to find and identify trends. For example, if a group goes to a beach and finds a large number of dirty diapers, then it is obvious there is a need for a changing area or campaign to discourage people from throwing diapers out in that specific area. By finding trends, there can be campaigns created to contribute to long-term conservation of the adopted areas and will lead to a significant reduction in waste and debris. Other examples of this include cans, cigarette butts and plastic bags. So surf our website for “shore”-fire ways on how you can help tackle this issue! Whether you’re a Boy Scout, Girl Scout or someone who just wants to make a difference, this program is an opportunity to help the community and learn different ways to clean up the water system. Email DZS Curator of Education Mike Reed at mreed@dzs.org to find an upcoming event near you.